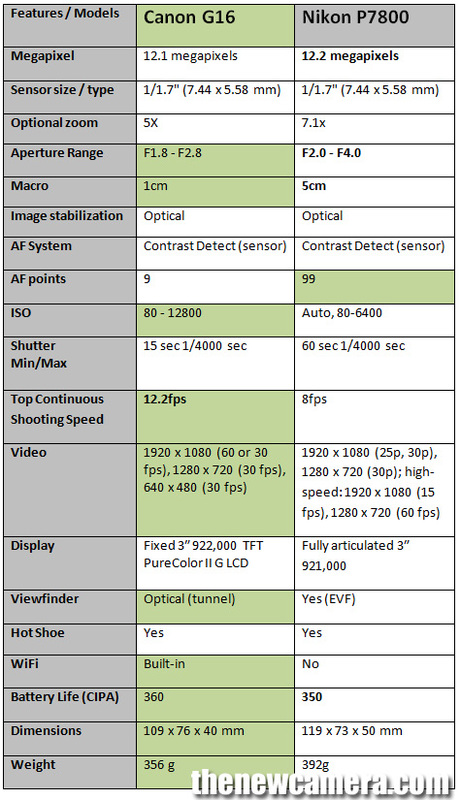 Nikon P7800 vs Canon G16 comparison, the newly announced G16 features new processor and noticeable improvement in overall performance, on the other hand Nikon P7800 comes with same sensor and image processor as its predecessor. Without any doubt I can clearly see Canon G16 is better, Nikon done nothing new with new P7800 model, they just added a EVF to P7700. Canon not only gives you bright aperture lens, you also get more ISO range + better Hybrid Image Stabilization, the another big change in G16 model is introduction of new DIGIC 6 image processor, so you get approx 50% faster AF speed compared to Canon G15, improved fast continuous shooting speed, better video quality and less shutter lag. (be +ve always, in any situation) The only good thing I see in Nikon is +3X optical zoom compared to G16, + more AF point. Nikon features 99 AF point and Canon G16 have 9 only, So P7800 have better AF system compared to G16 ? the answer is BIG NO….since both camera features contrast detect system, the AF speed is depends upon the image processor. Verdict: We highly recommend you to buy Canon G16 camera, you have no reason to buy Nikon P7800. I disagree with your conclusion. I believe that the articulating LCD, the longer zoom on a sharper lens and the EVF make the Nikon P7800 the better choice. Of course, each of us have our own priorities in a camera. I own a P7100 and would like to have a EVF. I am sure we would all like to see a bigger sensor, faster processing and faster autofocus. If a camera have articulating LCD and the longer zoom lens, It doesn’t mean that its a better camera…..
+ Nikon done nothing to improve its P7700 camera, they just added EVF to P7700 and named it P7800, It really a huge disappointment for all of us who wait 1 year to see some +ve change in the core specification of the camera. I have to also disagree. First the EVF in the Nikon is a huge improvement over the optical in Canon (which is basically the same as in my G10) but you give the edge to the Canon. Why? The longer reach Nikon lens is also a plus. If you knock the Nikon for being one step less in the ISO contest range, why then not give the 7800 an edge in the shutter speed range? If I were grading your comparison chart, I’d knock off grade points for not giving Nikon advantage credit (green color) for the shutter speed, fully articulated EVF which also allows one to protect the screen by turning it 180º, larger zoom range and an AEL/AFL lock button. I’d hand your project back to you an ask you to re-evaluate if you want a good grade. I think there are lot of people out there those who don’t care for image quality …. AT the end if you can read there is no improvement in image quality or image processor in P7800…NIKON P7800 USES SAME SENSOR AND IMAGE PROCESSOR AS P7700…all the basic core specification is almost same…. But Canon have a new image processor and we will sure see much improved image quality in G16…. BTW, I meant to say LCD back rotates, not EVF. @Mike. I fully agree that the G10 is outdated but for basic photos & video (I’m strictly consumer these days; no more 6X4.5 or 6X6 roll film). I regularly shoot with my Sony A77 (with the 16-50 ƒ2.8 and a Tamron 70-300SP) but want something not as heavy to lug around on day trips or at car shows so a wide angle lens is a must. Shooting outdoors necessitates an EVF as most LCD backs wash out in sunlight. I’ve looked long & hard at each new rangefinder type and been disappointed as all seem to just concentrate on the LCD back these days. I have even considered a Sony NEX-6 with the Tamron 18-200 with the Sony 10-18 down the road (“Of course honey it wasn’t expensive. Look at how small the set is.”) but it adds up to a lot of $$$ and do I then get rid of the Alpha system? I normally don’t shoot at ISOs over 400 because of the degradation/noise factors so that doesn’t really isn’t a game changer for me. So unless there is a serious difference in the processor or the EVF isn’t what it needs to be, I can’t see waiting any longer for Canon or Sony to come out with a decent rangefinder type with a good EVF. And thanks for the reply. Good discussions without rancor are always good to find.